In our Cheryl’s List #190 (February 24), we sent a survey to our readers to determine how extensively some of the newer z/OS technologies were being accepted. The survey is still open if you’d like to take it or see the original questions – at www.surveymonkey.com/r/RJ57FBL. Thanks so much to the 220+ people who have already responded, the table below shows the results of the survey. This list is sorted in ascending order based on ‘Currently using’, so the least exploited features are listed first. The same information is shown in graphical format below. There are many valuable insights that can be extracted from the data, and we went into these in some detail in the most recent Tuning Letter (2016 No. 1). You can use the table to get a feel for how many other mainframe customers are using a feature that you are considering. No one wants to be on the bleeding edge, but you also don’t want to miss some excellent technology that your competitors are all benefitting from. Most readers will know that we think that z/OSMF, the z/OS Management Facility, is one of the most important advancements in z/OS over recent years. z/OSMF is a browser-based tool that provides support for common system programming functions, such as management of WLM policies, standard methods for handling system dumps, and software management. We provided an introduction in our Tuning Letter 2010 No 2 (pages 4-11), an update in Tuning Letter 2011 No 4 (pages 29), and continual references in every Tuning Letter over the last six years. We are still disappointed to see that only 25% of the sites have installed it, but happy to see that at least 40% plan to install it. Suffice it to say, if you don’t have z/OSMF installed or planned, you will be missing out on some very sophisticated new z/OS facilities that are not available elsewhere. Of all of the features to exploit in z/OS, this is the one we would stress the most. We’ve been fans of SMF logger since it was introduced in 2008, and to find that less than 40% of the sites have it installed is more than a little discouraging. If you look at all the recent significant enhancements to SMF – support for zEDC, SMF record signing, and most recently SMF Streaming – all of them require that SMF is running in logstream mode. SMF log streams are simply a Must-Have. You can find out more about SMF Logger in Tuning Letters 2008 No 2, 2008 No 3, and 2009 No 3 and in IBM Redbook SG24-7919, SMF Logstream Mode: Optimizing the New Paradigm. z/OS 2.1 has been available since September 2013, and z/OS 1.13 goes out of service in four months (September 2016!!!! 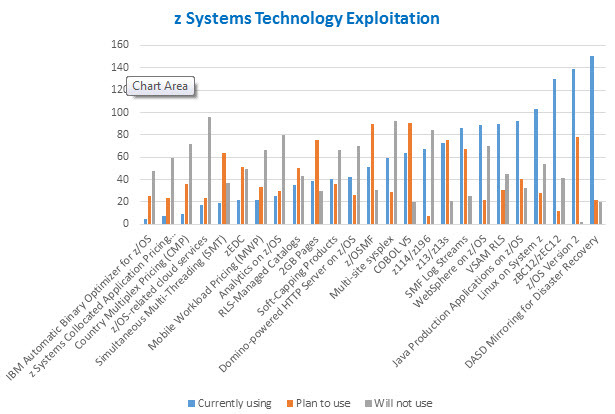 ), so we think that everybody (not just the 63% who responded) should have installed z/OS V2 by now. Certainly, if you haven’t installed it yet, go directly to z/OS 2.2. We hear from our customers who have made the move that it is very smooth, and, as we’ve pointed out several times, z/OS 2.2 has some very attractive features that you can exploit immediately. And now with IBM’s new focus on continuous delivery, you’ll find more new functions that will be available on 2.2 than on 2.1. What’s holding you back?